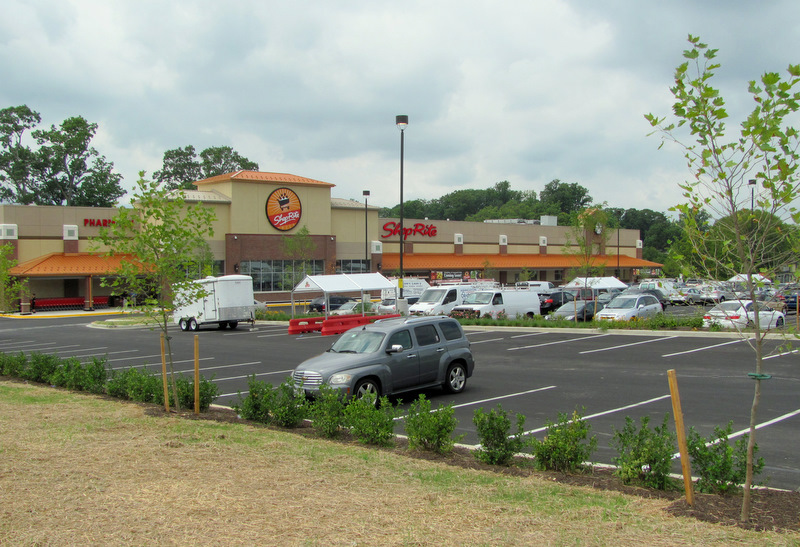 Above: Freshly seeded grass and a large parking lot greet shoppers at Hillsdale Road and Liberty Heights Avenue. This afternoon’s opening of a grocery store in Howard Park is expected to attract hundreds of nearby residents as well as scores of city, state and civic leaders vying for attention. The new 68,000-square-foot ShopRite has been touted by Mayor Stephanie Rawlings-Blake as an oasis in a so-called “food desert” that started in 1999 when a Super Pride store closed in this Northwest community. “I know it’s going to be one heck of a party,” Rawlings-Blake told reporters of today’s grand opening and community celebration hosted by the city and Klein’s Family Markets. Getting quality supermarkets – and healthy, affordable food – to low-income communities is a top priority of her administration, the mayor stressed. In the case of Howard Park, local citizens led the charge for a new supermarket through years of red tape and roadblocks. Their effort was capped by a struggle last year with Rite Aid, which finally agreed to lift a restrictive covenant at the site, permitting the start of construction by Klein’s and Uplift Solutions. “We can’t wait for it,” said Wayne Randall, a Howard Park resident who said seniors will especially benefit. “They won’t have to travel that far and won’t have to pay any hack money,” Randall said. Previously, the nearest full-service store, a Food King, was at Northwest Plaza at Wabash and Northern Parkway. The city, through the Baltimore Development Corp., spent millions assembling six acres of land on Liberty Heights Avenue between Gwynn Oak Avenue and Hillsdale Road. It agreed to defer payment on the land by the Klein family for eight years after settlement. An additional $1.5 million in city funds was allocated for employee training and site preparation, including $428,300 to tear down the derelict Super Pride building by P&J Contracting. Marshall Klein said that the grocery store and pharmacy will employ about 250 people, 40% of which will be full-time. He estimated that four out of five employees live in the city or county within five miles of the store.